Debris netting is used on construction sites to contain debris and on scaffolding to prevent debris from falling. 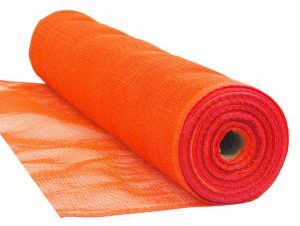 It is generally made from a durable, heavy-duty, plastic netting. 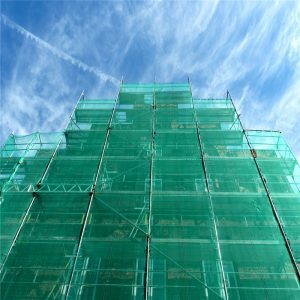 The Work and Height Regulations 2005 required that where public access to a potential danger areas is necessary, then debris netting must be used to catch falling materials, including dust which can cause discomfort or eye injuries. Risk assessments must be carried out to determine the safety measures that need to be installed. It provides safe containment of debris, protection of workers, the public and traffic. Its versatility as an enclosure system means it is easy and economical to handle and can hang vertically or horizontally to achieve maximum coverage. The edges are reinforced with eyelets for quick and easy attachment to a scaffold using wire or plastic ties. It allows air movement, which can ventilate the scaffold and reduce wind loading. It provides shading against bright sunlight whilst allowing enough light in for tasks to be carried out. It gives some protection to work areas and workers from inclement weather conditions. Debris netting is typically green in colour. However, in sensitive of high profile locations, debris containment can be provided using printed materials that can for example show the façade of the building behind the material, images of the completed development, details of the project team or client, advertisements and so on. For more information see: Building wraps.